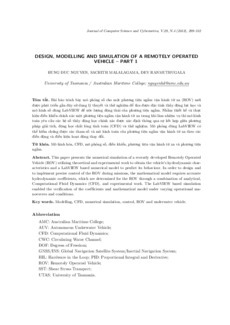 This paper presents the numerical simulation of a recently developed Remotely Operated Vehicle (ROV) utilising theoretical and experimental work to obtain the vehicle's hydrodynamic characteristics and a LabVIEW based numerical model to predict its behaviour. In order to design and to implement precise control of the ROV during missions, the mathematical model requires accurate hydrodynamic coefficients, which are determined for the ROV through a combination of analytical, Computational Fluid Dynamics (CFD), and experimental work. The LabVIEW based simulation enabled the verification of the coefficients and mathematical model under varying operational manoeuvres and conditions.